For now, some useful links. UKTV (a brand name) description of their TV channel brands. Wiki: TV in the UK. 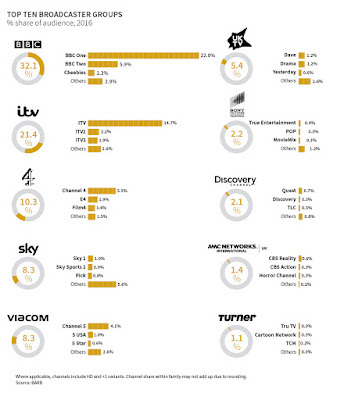 UK audience share of major TV corporations, including infographic. 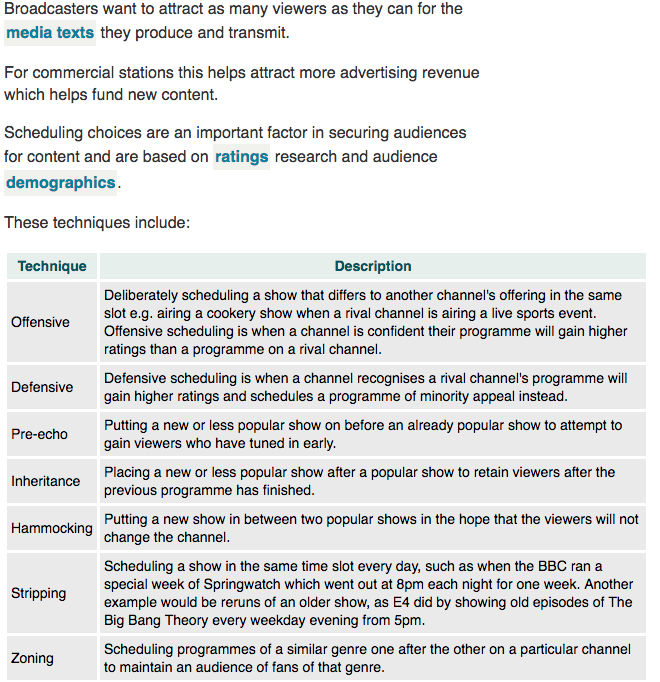 Cost of placing ads on different UK TV channels. Would people miss the BBC if it was scrapped? Description of some major TV brands for advertisers. 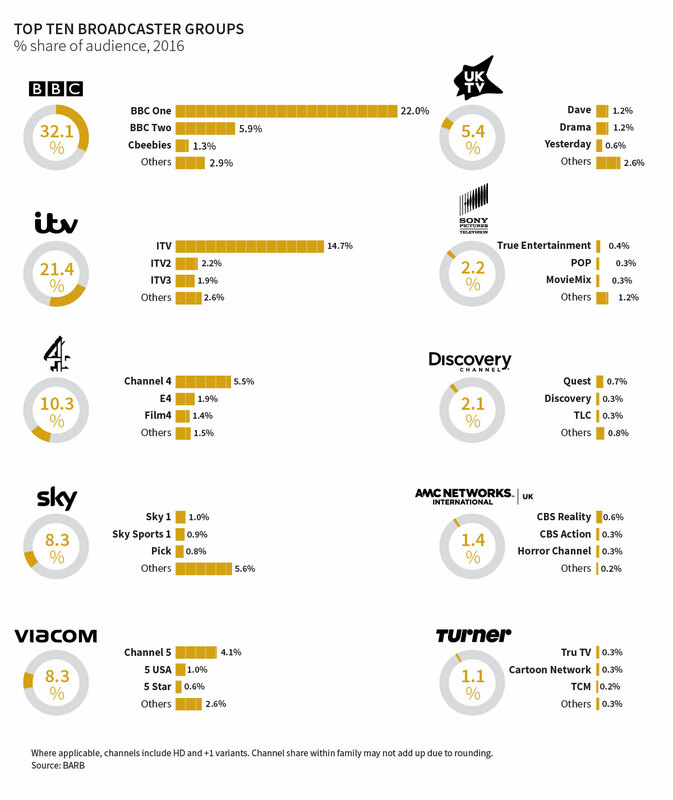 10 most-watched UK TV channels. Co-production - not as universal as it is in the film industry, but with production budgets rising it is going that way. The BBC often co-produce with an American network to enable high budget productions. DVDs and Blu-Ray remain an important secondary market for TV production. Also see watershed. deregulation - rules on TV ownership and content have been simplified and reduced since the 1980s. Satellite/cable and later digital channels were given minimal restrictions compared to the existing analogue, PSB channels. PSB - public service broadcasting describes the requirements and output of the terrestrial channels BBC1, BBC2, ITV1, C4 and C5 (plus the BBC's other channels), legally required to carry a minimum of news at certain times for example, unlike digital channels. second screening - the common habit (especially of millennials!) of viewing TV while using a gadget to chat or post on what they're watching. Advertisers like to see evidence of such engagement, and programme makers/channels often encourage this with hashtags for example. spectrum scarcity - right up to 1982 the UK had only 3 TV channels (BBC1, BBC2, ITV). Channel 4 was launched as new technology meant a 4th station could be squeezed into the analogue signal. 15 years later, with more improvements to compression technology, C5 was added.